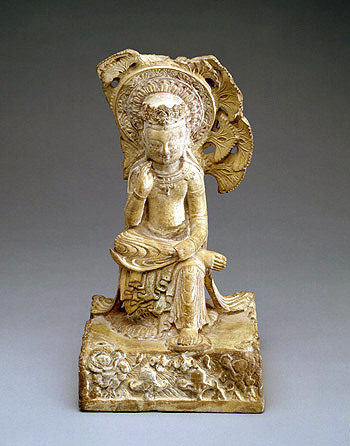 The Bodhisattva Milo (Sanskrit Maitreya), seated in "Pensive Pose", ca. 575. "This sculpture of a bodhisattva, or enlightened being, probably represents the Buddha of the Future (Maitreya in the Indian language Sanskrit) while he was waiting to be reborn into the world as a Buddha. Maitreya waits in heaven meditating beneath a Dragon Tree, which Chinese sculptors typically interpreted to be a ginkgo, like the tree here. The depiction of children emerging from lotuses in a pond on the base of this sculpture is a rare detail on an image of Maitreya." Found at the website of The Smithsonian's Museums of Asian Art. 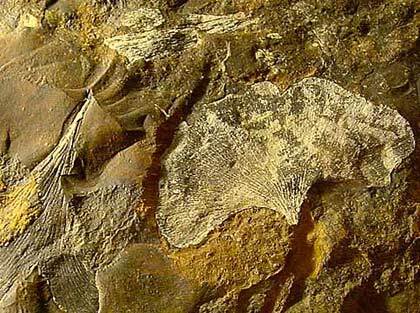 Fossil: Ginkgo adiantoides from the Tertiary period (56 million years ago) is remarkably similar to modern Ginkgo biloba. I took this photo at Naturalis Museum, Leiden. Satomi Takataki, Giant Ginkgo of Hongou, Japan. Wonderful photos of this old tree on this blog. 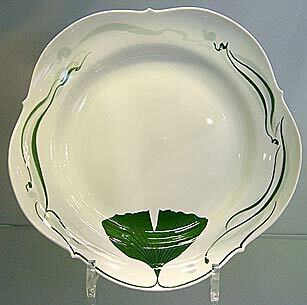 Plate with Ginkgo leaf design. Staatliche Porzellan-Manufaktur Meissen GmbH, Porcelain Museum Meissen, Germany. "Jugendstil" design by Prof. Heinz Werner, inspired by Goethe's poem about the Ginkgo, 1984. My photo (enlarged) on my Art-page. On my website you can see an enlargement of this photo. 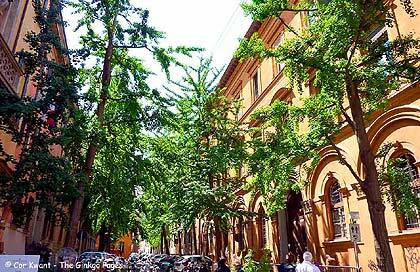 I took this photo in 2012 of 15 Ginkgo trees, Piazza de’ Calderini, Bologna, Italy. In this area are many Ginkgo trees. "More than 100 countries and regions around the world have set up TCM institutions, with the United States, Europe, Japan and South Korea investing heavily in research and medication development, industry analyses show. The UK-based pharmaceutical giant GlaxoSmithKline announced its first TCM medication research and development program, which targets not just the Chinese market, but the global one as well. 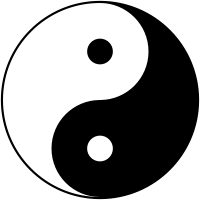 "TCM is a well-established medical science based on thousands of years of clinical practices. It shows great promise treating complicated conditions that the single-target Western medicine has failed to handle," says Zang Jingwu, senior vice-president and head of GlaxoSmithKline's R&D in China. An example of this is Ginkgo biloba leaf extract, approved in Germany, which, according to China's pharmacopeia, is TCM in essence. " Read more : ChinaDaily (English). Time-lapse video of Ginkgo tree(s) shedding leaves in Japan. Video by kiikunkunman on YouTube. * Added video on my Art-page of Ginko carbon table by Ross Lovegrove.